It’s a cold and snowy day [again]. We seem to be having a lot of these lately. Another foot of snow, making the total for the winter season thus far unreasonably high. As a mid afternoon snack, I made this braided pizza bread using a refrigerated pizza dough I had handy. I lay the rectangular dough out on foil [for easy cleanup] on top of a baking sheet. 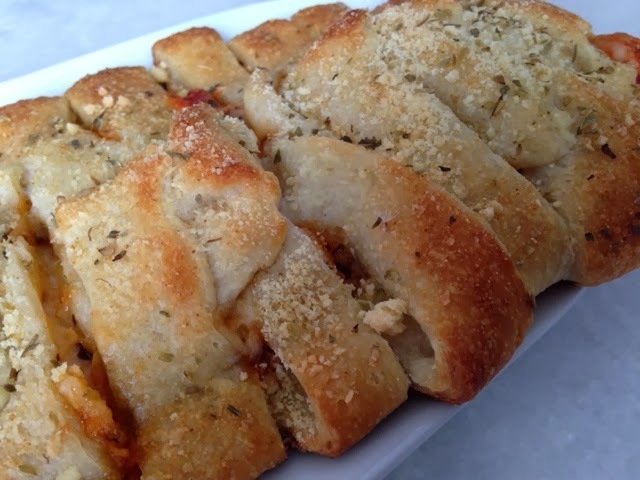 cut the top and bottom parts of the dough to create strips.Down the center, pour marinara sauce, shredded mozarella cheese, parmesan cheese, oregano flakes, garlic powder, and red pepper flakes. Next time, I’d add strips of bell peppers and chicken too.Fold the strips on top to create a braided look. Brush the top gently with oil oil. Sprinkle with parmesan cheese, garlic powder, and oregano. Bake in your preheated 400 degree oven for about 15 minutes.